Prominent & Leading Exporter from Faridabad, we offer beaded trim and beaded tassels. The Beaded Trim is offered by us to customers in bulk. The offered Beaded Trim is known for its elegant quality. 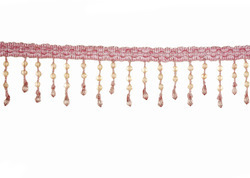 Moreover, this Beaded Trim is offered by us to our esteem customers at market leading rates. This Beaded Trim is available in the market in wide range and one can avail these products in bulk also. Being the leading names in the industry, we are offering an extensive range of Beaded Tassels. Keeping track of industry distinct parameters, we design and craft the offered tassels by making use of quality tested raw materials and latest technology. Apart from this, these tassels are enormously used in garment and textile industry. Clients can avail these tassels from us in varied colors at market leading rates. We have emerged as a leading organization, engaged in offering superior quality Beaded Tassels. The entire array of tassels is designed in such a way that we are able to maintain set quality standards. Owing to their remarkable features, these tassels are largely demanded in garment industry. In addition, clients can avail the offered tassels from us in a wide range of specifications at market leading rates. By keeping track of current market development, we are offering an excellent range of Beaded Tassels. Widely used for crafting garments and textile products, we design the offered tassels utilizing best grade raw materials and latest technology. Apart from this, our quality examiners test the entire array on different parameters to eradicate any possible fault from. Clients can avail the entire range of tassels from us in multiple specifications as per their needs. Our firm is counted amongst the significant names, offering a wide range of excellent quality Beaded Tassels. Offered tassels are mainly used for crafting home furnishing products. The offered tassels are strictly tested under the direction of our adroit professionals against the exquisite parameters of quality to make sure hassle free range to our clients. In order to this, these tassels are highly demanded in the industry for its quality attributes.